The Audi A8 is the automaker's biggest and most luxurious sedan. It competes against long-time stalwarts such as the BMW 7-Series and Mercedes-Benz S-Class—perhaps even against tonier sedans such as the Bentley Flying Spur and Rolls-Royce Ghost. The Audi relies on a hefty dose of technology to woo luxury buyers. 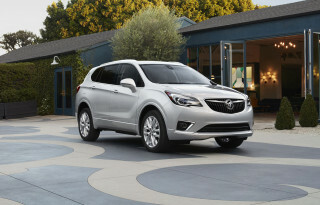 A new model arrives for the 2019 model year with a spate of new technologies. 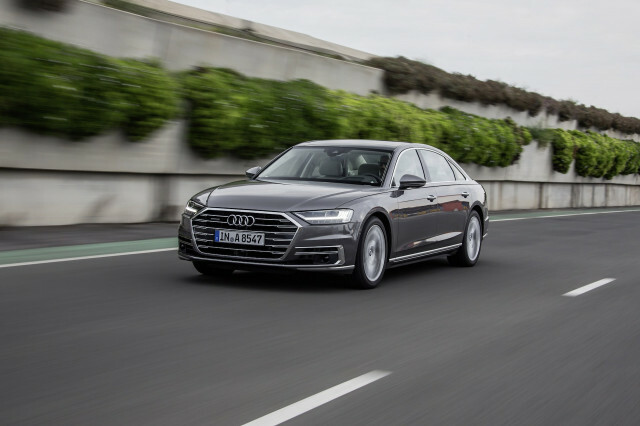 The 2019 A8 features some of the latest tech, but it lacks self-driving hardware found in other countries due to U.S. regulations. The new A8 arrives with a look that's not much of a departure from the current car. 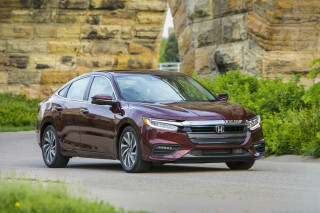 A wider front end, larger air intakes and slimmer LED headlights match up with taillights that span the width of the car, none of which disrupts its executive-sedan mission. Inside, the A8 has wiped nearly all the switches and toggles from the cockpit, and has replaced them with touchscreens that surround the driver. Gone, and good riddance, touch-sensitive control puck. Audi has recast the A8's body and made it stronger by blending more materials in with its aluminum frame. The sedan now has some steel panels, some magnesium pieces, even carbon-fiber-reinforced plastic that all reduce weight. Audi replaces that weight with motors and batteries. The new A8 is its first model line that's electrified—not pure electric, but at least mild-hybrid capable. In the U.S., a new 3.0-liter turbocharged V-6 with a belt-driven motor-generator and a 48-volt electrical system makes 335 horsepower. Over its lifespan, the A8 in the U.S. will gain twin-turbo V-8 mild-hybrid models, and a plug-in hybrid edition with more batteries and stouter motors, for a 30-mile plug-in driving range and 449 hp net. That A8 L e-tron also will offer a wireless charging system. The A8 offers a new active suspension that uses camera data to predict and react to coming road surfaces. Its all-wheel-drive system is available with a rear differential. 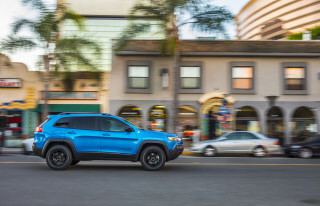 A new rear-wheel-steering system can dial in as much as 5 degrees of opposite steer at speeds under 37 mph, for superior parking-lot maneuvers. Audi Drive Select coordinates steering, powertrain, and suspension with different preset modes and a programmable setting that allows the driver to control each component independently. The A8 feels more nimble than some of the vehicles in its class, but it's still tuned for the tastes of its buyers—not shocking, never abrupt, always collected and calm even when it's accelerating with the quickness of a supercar. Finally, on the technology front, Audi's new array of laser and radar sensors and cameras give the A8 Level 3 self-driving ability in some countries, which means the car will take control of steering and braking and acceleration indefinitely, until it senses higher road speeds, obstacles it can't correct for, or other more complex driving situations. Audi hopes it will be able to sell the system in the U.S., but it won't come until states and the federal government agree on how self-driving cars can be made legal to operate in a systemic way. The system will engage via a console-mounted button. Other functions, from navigation to climate control, will be operated on the A8's central touchscreens, which have pressure-sensitive haptic feedback. High-end leather, wood, and premium audio seem quaint by comparison to the A8's new driving technology, but they're available. In its third generation, the Audi A8 delivered strong performance and good looks, though it wasn't quite as dramatic as cars like the Jaguar XJ, the other aluminum-bodied vehicle in the class—or even the current Mercedes-Benz S-Class. The A8 went on sale in the U.S. in the 2011 model year, with a 4.2-liter V-8 rated at 372 hp, which Audi quoted as having a 0-60 mph time of 5.7 seconds and an electronically limited top speed of 155 mph. A W-12 engine option was added for the long-wheelbase model in 2012. For 2013, a pair of new engines replaced the former V-8. The lower portion of the current powertrain lineup included a supercharged 3.0-liter V-6 with 333 hp, and a 0-60-mph time of 5.5 seconds; and a 4.0-liter twin-turbo V-8 with 420 hp and a 0-60 mph time of 4.7 seconds. Above them was the performance-oriented S8, which used a 520-hp version of the twin-turbo 4.0-liter and hit 60 mph in 3.9 seconds. The most expensive was the W-12, a 6.3-liter that made 500 hp and was good for a 0-60 time of 4.4 seconds. 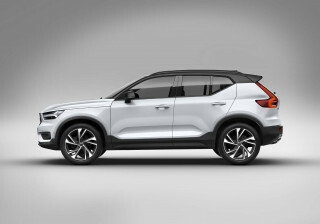 A 3.0-liter turbodiesel V-6 was added for the 2014 model year, available only on the long-wheelbase model, and was rated at 24 mpg city and 36 mpg highway, according to the EPA. In 2016, the 4.0-liter V-8 was uprated to 450 hp. The third-generation A8's subtle looks steered attention toward its rich finishes and high-tech features. Its infotainment system used Audi's Multi-Media Interface (MMI), including MMI touch, which allowed fingertips to trace out individual letters of destinations, for example. It had a built-in wi-fi hotspot capability and Google Earth 3D navigation-system data—the latter continues to bring some of the most detailed, attractive map interfaces in any car. For the fitting final touch, Audi offered a magnificent Bang & Olufsen audio system, with tweeters that rose from the dash surface when the system was switched on. The car's central display screen could also hide in the dash when not needed, for a cleaner look and an unobstructed view out the front. For 2016, Audi nixed short wheelbase versions of the A8—only the S8 could be ordered with a short wheelbase. In addition to the longer wheelbase, Audi initially offered an A8 Sport (with the uprated V-8) that was made universal for 4.0T models in 2017. A sport exterior package that mimicked the look of the S8 was made standard for A8 models in 2017 as well. The A8 carried through into the 2018 model year with only minor changes, including an available Executive Package trim on V-6 versions of the car. Preceded in sales by an 8-cylinder version of the A6 sedan called the V8, the Audi A8 was born after the automaker split off the special model and created its signature aluminum space-frame construction. Audi sold the first-generation A8 from the 1998 model year through 2003. It heralded two firsts for the company: its first mass-produced vehicle with an aluminum space frame and its first car to offer six airbags. The A8 came to the U.S. with a V-8 and standard quattro all-wheel drive for most of that time, while other markets also saw 6-cylinder versions as well as a W-12 engine—a 12-cylinder layout that is basically a pair of V-6s joined side by side. Later in the first generation, Audi offered a high-performance S8 in the U.S. In its second generation, which was sold from 2004 through 2010, the A8 returned with a 4.2-liter V-8 and a six-speed automatic transmission sending power to all four wheels. This A8 was offered in both short- and long-wheelbase models. Audi also brought back the W-12, now displacing 6.0 liters and making 450 horsepower. The second A8 was distinguished by its extra-large grille, which was part of the brand's signature at that time. When the second-generation A8's run ended in 2010, it had reverted to a V-8-only engine menu. Excellent automobile and the safety features are a plus! We've owned our Audi A8 L for just over a year now and there is only one thing I would change: I'd move the gas filler to the driver's side of the car (left side). Whether we're running everyday errands or on... We've owned our Audi A8 L for just over a year now and there is only one thing I would change: I'd move the gas filler to the driver's side of the car (left side). Whether we're running everyday errands or on a 900-mile road trip (we got 35 mpg) this car performs flawlessly and in total comfort.